Of course my Christmas was full of delicious food too...Traditionally, we have pea soup, fried fish, potato salad, and Czech cookies as part of our Christmas Eve dinner, but this year I wanted to mix it up and add a dish since I'm not crazy about potato salad in the first place...and sweet potatoes were the first thing that came to mind! They turned out great and more importantly were so fast and easy to make ;) Definitely the perfect idea for a New Year's dish too, even as a dip! Steam sweet potatoes on the stove (in a colander) for about 20 minutes, or use a crockpot. Cook until soft. Add a pinch of pepper if desired. Meanwhile, finely chop onions, including their green stalks. I cut them in half lengthwise and then minced them entirely. 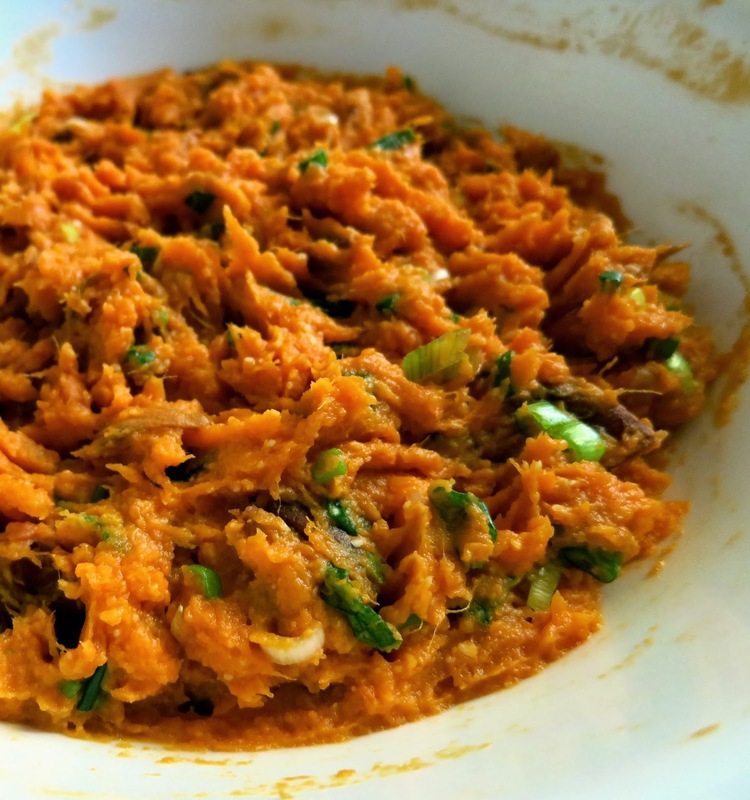 Transfer cooked sweet potatoes to a bowl and mash with a fork. The sweet potatoes should be soft enough for this to be easy. Warm milk in the microwave until it is steaming hot, and pour into the bowl. Add onions and Parmesan cheese, and mix well until all ingredients are combined into a mash. Serve right away, or cover, refrigerate, and reheat when ready to serve. Enjoy! These came out delicious! Had then with a turkey and bacon meatloaf and it was perfect. Thank you. That's great, I can't wait to go back this Christmas :) Thanks so much for trying out the recipe and commenting!! I want to make these for thanksgiving, can the potatoes be baked or do they need to be steamed?